The struggle is real. Delhi Dynamos' wait for a win continues. Gianluca Zambrotta's side stunned Chennaiyin FC in its Indian Super League (ISL) 2016 season opener three weeks ago, but the team is yet to win another match since then. It has played five matches since that opening match, but has drawn four and lost one. The latest draw came against Pune City FC on Thursday. This was a laboured display — unlike the action-packed performance against Atletico de Kolkata in its previous match, the host team had to work its way to earn one point against Pune. Before the match, Zambrotta was adamant that his team had not veered off-path from its pre-season objective of making the semi-final. "I think the equation is somewhat the same, because in the last game (against ATK), we had quite a lot of opportunities to score. Unfortunately we did not kill the match, but when we do have a lot of opportunities to score, then it's not a problem for me," he had said. However, on Thursday, in front of a sparsely-filled Jawaharlal Nehru Stadium in the capital, Dynamos found it tough to assert themselves on the opposition. The opening exchanges saw the hosts dominate the proceedings, but Pune goalkeeper Apoula Bete's heroics ensured an early goal did not come to pass. However, after the opening quarter, Pune's tactical shift began to have a bearing on the match. For the rest of the half, Dynamos looked ponderous in possession. Pune had three men in central defence and were able to counter the threat of Richard Gadze and Marcelinho. In fact, the breakthrough came from the visiting side. In his post-match comments, Zambrotta identified inability to maintain concentration throughout the 90 minutes. But on the stroke of half-time, the familiar devil struck again as Jesus Rodriguez Tato was allowed room to land a looping header home. After losing to Atletico in what the manager described a "cruel" manner, it was the kind of moment that would have deflated Dynamos. An insipid first-half performance culminating in a goal out of nowhere was the last thing the hosts would have wanted. To add to their woes, Pune's high defensive line had compressed the pitch and forced Dynamos into rushed decisions. Zambrotta made four changes to starting XI, a statement about the prevailing situation. The metronomic presence of Marcos Tebar was replaced by Emerson Moura, which ensured the hosts could not circulate the ball well enough. Furthermore, left-back David Addy came into the side. The Ghanaian left-back is an aggressive runner, who often pushes forward in attack. 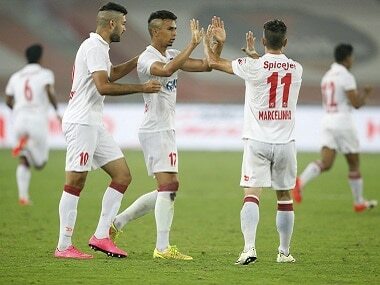 But with Marcelinho drifting inside, Addy failed to challenge the opposition wing-back Narayan Das adequately. In defence, however, Dynamos functioned reliably. Anas Edathodika finally returned from the injury he had sustained during the opening match of this campaign against Chennaiyin, and he once again paired up with Spaniard Ruben Gonzalez Rocha. The central defensive partnership is supposed to be Zambrotta’s first choice pairing and it will be interesting to see whether it repays the confidence in the coming weeks. With Dynamos trailing, the focus in the second half shifted to their offence. The introduction of Bruno Pelissari and Badara Badji sharpened the hosts in the final third, but the much-sought after goal arrived from a set piece. A cleverly executed routine saw Marcelinho tee Milan Singh up for a coolly placed finish. The goal was a well-deserved reward for Milan, who had threatened in the first period by making late runs into the box. Although this was only his first goal of the season, the 24-year-old has been a regular feature in the side as his astute contributions in the centre of the pitch have been highly regarded by Zambrotta and his staff. "He is a very young and promising talent for Indian football. Since he is young, he has a lot of scope to get better," the Italian manager said after the match. The Manipuri midfielder began his I-League career with Pailan Arrows before moving on to Shillong Lajong in 2013. Last season, Milan turned out for the Pune-based club DSK Shivajians. Although he is yet to represent the national side, the central midfielder has been part of the India Under-23 setup. If he can remain consistent, a call-up can be expected soon. Another player who continues to impress is Marcelinho. After his missed penalty in the previous match proved crucial in Dynamos' loss to Atletico, the Brazilian came back with a decent performance that saw him at the heart of his team's activities in the final third. Before the game against Pune, Marcelinho had identified the solution to his ongoing pain following the mistake. "I need one victory to help forget the match," he told the ISL website in an interview. Unfortunately for Marcelinho and his teammates, the coveted three points remain out of their grasp. They will try again when they meet FC Goa in an away encounter on Sunday. But the defence will need to maintain its focus for 90 minutes, something that has not been associated with Dynamos in the past fortnight or so. But the bigger problem remains putting the chances away. Zambrotta will hope that the spirit of that free-flowing display against Chennaiyin FC can be recovered as soon as possible. Until then, the struggle is real.